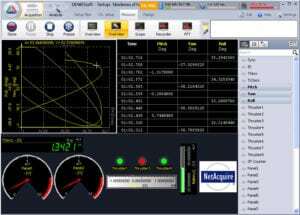 NetAcquire Corporation now supports another real-time data display option using DEWESoft software running on a Windows PC. The combination of a NetAcquire server plus DEWESoft software offers the ability to easily create customized graphical displays without programming. Each graphic data element can be connected to NetAcquire publication values with a simple drag-and-drop step. The types of displays supported include 2D and 3D graphs, analog dials, digital displays, bar graphs, indicator lamps, and more. As part of an interactive processing capability, DEWESoft also supports statistics, classification, and frequency domain analysis. All of these added capabilities are combined with the full power of the NetAcquire PCM high-speed serial data I/O system that includes advanced frame synchronization, as well as the NetAcquire Data Flow option which supplies data decommutation, real-time calculations, and network communications. DEWESoft software can be purchased directly from NetAcquire Corporation for operation with the NetAcquire Windows Client Toolkit.